Composite materials are used to make cars, planes and boats, and have been used to build minesweepers and small surface combatants. Now, the largest composite structure ever built—the DDG 1000 destroyer deckhouse—has been fabricated in Mississippi and is being shipped to Maine for assembly aboard the future USS Zumwalt (DDG 1000). In this dramatic example of a “shared build,” General Dynamics Bath Iron Works is the lead yard, but the superstructure and hangar are being built at Huntington Ingalls Industries (formerly Northrop Grumman Ship Systems) Composite Center of Excellence at Gulfport, Mississippi. The composite deckhouse, which sits upon a steel base fabricated at HII’s Pascagoula yard, will be placed on a barge and transported to Bath by sea, a transit of more than 2,000 nm. The deckhouse is being built at HII to take advantage of the Gulfport facility’s unique capabilities with composites. Dorsey says the facility builds large ship structures using fiberglass and carbon fiber, as well as core materials such as balsa wood. 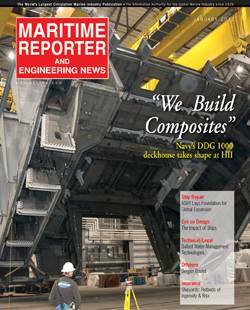 According to Jay Jenkins, the HII site director at Gulfport, the company is using the Vacuum Assisted Resin Transfer Molding (VARTM) process for the DDG 1000 deckhouse involving carbon fiber fabric, balsa wood, synthetic foam and a resin system. He says composite structures with the same strength are half as heavy as steel and a quarter to a third as heavy as aluminum. Less topside weight improves stability and has speed and fuel efficiency benefits. Plus, it doesn’t fatigue and won’t crack or corrode, and you don’t have to paint it. “Lifecycle costs are dramatically less,” Jenkins says. In fact, a main feature of the DDG 1000 deckhouse is that the antennas—or apertures—are embedded directly in the structure itself. The deck house is covered with radar absorbing material. Altogether, with the many ways the DDG 1000 design reduces signatures, this 14,000-plus ton ship has the radar cross section of a small fishing boat. When major sections of a ship are built at two different yards, it’s important that the modules are fabricated to exacting specifications to ensure a proper fit. The Gulfport facility has built mine hunters for the U.S. Navy as well as composite masts. Jenkins says the Gulfport facility is uniquely capable and qualified to build large modular structures, such as deckhouses for combatants. “We are also building the forward and after masts for theUSS San Antonio-class (LPD 17) of amphibious ships. These are essentially radomes, where the antennas are inside instead of outside,” Jenkins says. USS Arthur W. Radford (DD 968) received the prototype composite Advanced Enclosed Mast/Sensor System (AEMS) in 1997, upon which the LPD 17 masts are based. That mast was fabricated here at the shipyard facilities in Pascagoula, Miss. “Composites uses different types of materials combined together to achieve the properties and characteristics you want it to have,” Jenkins says. Such a replacement program would be a major undertaking, Jenkins says. But why not build the next generation of Arleigh Burke destroyers—known as DDG 51 Restart—with composite deckhouses and hangars? Unlike steel, composites do not conduct electricity and does not have a magnetic signature. Composite can burn, and there is a toxicity of the resins in the cloth system. But the balsa core acts as an insulator. Balsa will char but it doesn’t really burn, and altogether the composite structure doesn’t transfer heat the way metal does. On a steel ship, if there is a fire in one space, the adjoining space will heat up quickly. But composite acts as an insulator and will confine the fire, and basically self-extinguishes itself once the heat source is removed. If you held a piece of the composite material in your hand, you might think it would be vulnerable to attack. But, Jenkins says the current structure used on DDG 1000 is comparable to a metallic structure for ballistic protection. If specified, an aramid fiber like Kevlar could be incorporated into the composite for greater protection. The balsa used for the core isn’t a special kind of wood. It is imported from Ecuador, and comes in different densities—12, 15 and 20 lbs. per cubic foot. “We use the denser wood where we need greater stress resistance,” Jenkins says. Because the carbon fiber is black, it’s not possible to see imperfections such as bubbles or a place where the cloth didn’t bond, Jenkins says every item fabricated at the plant is inspected with ultrasound. It’s like any other composites facility, Dorsey says, but to a large scale. For example, the center boasts the world’s largest computer numerically controlled (CNC) saw. HII found that qualified workers for composite structures were not easy to come by. All employees receive three weeks of classroom training, and they’re tested before they are allowed out onto the shop floor. The company also established a U.S. Department of Labor Certified Composite Apprentice Program. When the company had difficulty finding people with experience fabricating ship sections, they realized they had an untapped market. Since much of the work with composite structures involves the wood core, HII started recruiting people with carpentry experience. Since the housing market was depressed in the Gulf Coast region, people who were skilled with working with wood were available. The first two DDG 1000 deckhouse and hangar assemblies are in production, with the third—DDG 1002—now under contract. The future of the facility is unclear. Originally planned as a class of 32 ships, then 24, then 7, the Navy finally decided to build just three Zumwalt-class destroyers.. “The business case for this facility is seven,” says Dorsey. About the Author: Edward Lundquist is a naval analyst and principal science writer with MCR Federal LLC.